Big corporations are being called on more and more to show corporate responsibility and give back to the community, yet often we are cynical when they do. ‘Oh, they are only doing that because…’ or ‘They are just paying that community off to get them on side…’. Unless I’ve missed something, this partnership between the ruling monarch of homewares, IKEA, and the UN Refugee Agency (UNHCR) is genuinely giving back, showing some classy business leadership, and making a real difference. IKEA has committed Euro 73 million (AUD 103 million) to UNHCR to “improve the living situation for families and children living in refugee camps in Ethiopia, Sudan and Bangladesh by providing care, education and better shelters”. Of course it isn’t all that hard to hand over a lot of money when you made Euro 3.2 billion (AUD 4.5 billion) in profit in 2012. But here is what I think is the best part: not only is IKEA supporting the UNHCR with their cash, it is also supporting the agency with knowledge and skills. The business vision of IKEA is to ‘create a better everyday life for the many’. This partnership shows that this vision includes people who don’t have a home at all by creating their best flatpack yet: a small house that can be sent to refugee camps to provide a more comfortable, durable and dignified shelter than the traditional tents. If not the best in the business, IKEA is certainly the biggest when it comes to design, warehousing, logistics and of course flatpacks, so this really is a perfect match for the needs of UNHCR. 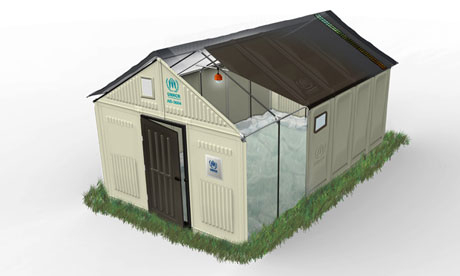 These shelters are currently being tested at the Dollo Ado refugee camp in Ethiopa, with Somali refugees providing feedback about the design, and there is a plan to also trial the prototypes in Iraq and Lebanon. Shelters come with a solar-powered light to help with refugee comfort at night time, and as IKEA says, so children can always keep reading and learning no matter what their circumstances. It probably goes without saying that these aren’t in your local IKEA catalogue; they are exclusively for the people who really need them. IKEA isn’t without its controversies in its 70 years in business but this latest move in corporate social responsibility helps improve the fundamental needs of some of the world’s most vulnerable. More information about the partnership is on the Ikea Foundation website which has a great video explaining the project and showing assembly of the shelters.